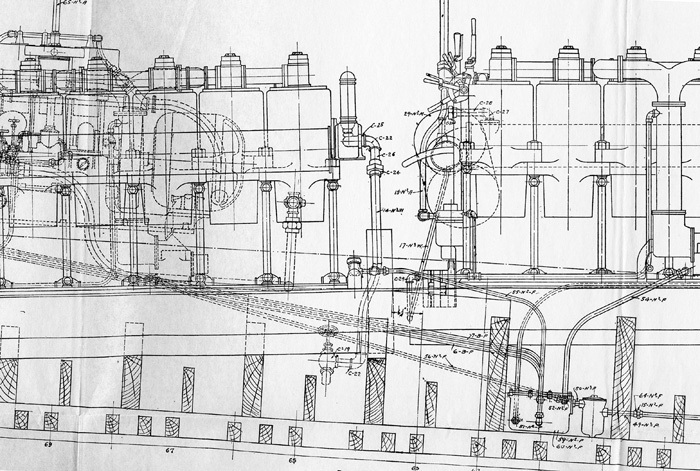 Images from the 110' Submarine Chaser engine manual, Standard Motor Construction Company, 1919. The float box between the fuel tank and the engines, which regulated the flow of gasoline, was gravity fed. From this point, fuel was pumped to the engine, with air entering the mix in the vaporizer. 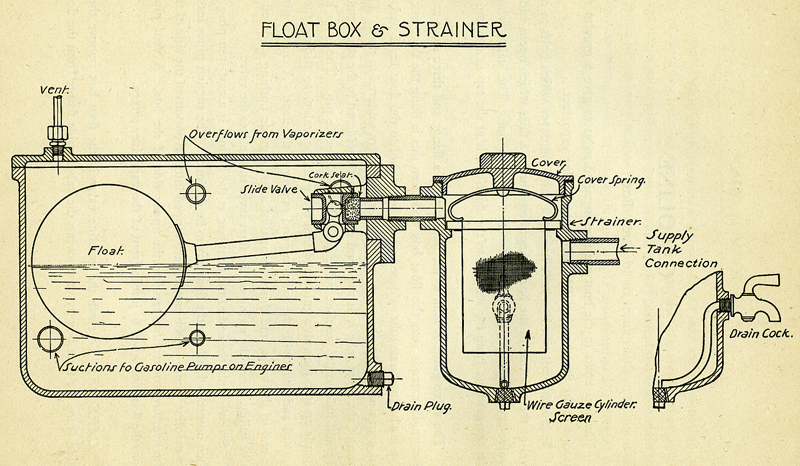 Apparently there were only two float boxes (and their strainers), shown [in the engine room diagram] between the no. 5 cylinders of the two outer engines and forward of the center engine. The port float box served the port and the auxiliary engines, the starboard float box served the starboard and the center engines. There were times when all four engines were in use simultaneously. [The diagram, below] shows the starboard float box, and its strainer and piping, below the engine room's sloping deck, near the keel and the port engine's no. 5 cylinder. The fuel did indeed use gravity, but to get from the main fuel tanks to the float boxes only. The fuel was pumped from the float boxes up to the vaporizers, which were mounted on the engines just above the engine room's deck. A float ball in a float box maintained a fuel level, just like an ordinary home-toilet tank. The float box's function was similar to that of the float bowl of a carburetor on a pre-fuel injected automobile. Each engine had its own self-powered fuel pump, and when an engine was running, this pump lifted fuel from the float box up to the vaporizer (carburetor, sort of, and located between no. 3 and no. 4 cylinders) where the fuel was mixed with air and drawn into the engine by the vacuum of the intake stroke. There were back-up hand pumps in case of failure of the engine-driven pumps. The float boxes were very low, well below the engine room deck, almost touching the keel. A Black Gang crewman had to crawl down into the slimy dungeon under the engines, into the bilges, and between the numerous supports for the engines to service the float boxes and the strainers (such as to draw off some fuel to test for water in the fuel, to clean the strainer screens, etc.). The Black Gang should get a medal just for this sort of activity alone.